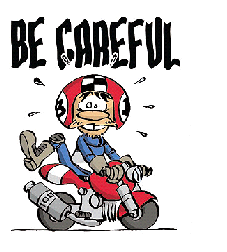 A safety message with a difference, the Lucky 13 cartoon series, was developed by the European Motorcycle Industry – ACEM – within the framework of the European Road Safety Charter. The series, published throughout 2009, features Lucky 13 a motorcyclist who explains with his clumsy behaviour what to look out for as he rides around the roads, avoiding the potential risks related to the infrastructure. With a smoothed out “Joe Bar Team” style and a general new to motorcycle public slant, there is a message even for those who consider themselves experienced or new to the sports bike motorcycling gender. Each issue of the cartoon focuses on a particular risk factor giving tips and recommendations to riders on how to best tackle different situations. Episodes which you can viewed feature; junctions, roadside hazards, dangerous road surfaces, diesel and liquid spills, damaged and badly repaired surfaces, traffic calming devices, night time hazards, winter and ice treatments, surface debris, outsized central islands, metal and paint, curves, and eventually, curves with decreasing radius. View cartoons at www.acem.eu or click here. Link to cartoons open in a pdf – average size 1.5mb to 2mb.